North Side restaurant is a consistent winner. The Bavarian Peasant Platter with (top to bottom) grilled bratwurst, smoked pork loin chop, and knackwurst accompanied by German potato salad, and potato pancakes with apple sauce and sour cream. Fall is the time of year when all things pumpkin emerge. There’s another flavor profile that’s also especially popular this time of year—German food and drink. One reason for this is the original Oktoberfest which was held to commemorate Crown Prince Ludwig’s, who would become King Ludwig I, marriage to Princess Therese of Saxony-Hildburghausen on October 12, 1810. Citizens of Munich were invited to attend the festivities held on the fields in front of the city gates to celebrate the royal marriage. Another reason is that German cuisine provides hearty sustenance against the progressively colder weather. Pittsburgh—especially the North Side and its Deutschtown neighborhood—was a popular destination for many German immigrants in the 1800’s. Germans made up a large part of the Pittsburgh cultural melting pot. Evidence can still be seen with Penn Brewery, Teutonia Männerchor club, and Max’s Allegheny Tavern. The entire North Side was known as Allegheny before being annexed by Pittsburgh in 1907. 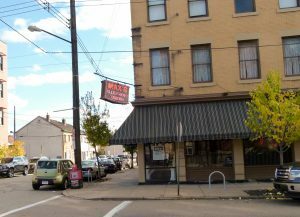 Max’s Allegheny Tavern is situated just off the beaten path, a few blocks north of East Ohio Street at the corner of Suismon and Middle Streets. It was opened as Max and Erma’s Allegheny Tavern in 1977 by new owners, but the name conflicted with the growing chain from Ohio of similar name so they shortened it to Max’s Allegheny Tavern. The restaurant and bar have been a stalwart of German food and drink since then. Max’s Allegheny Tavern actually encompasses two historic North Side Hotels. 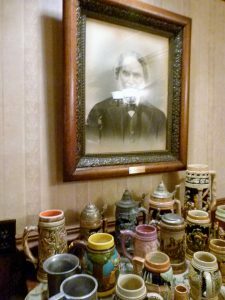 Max’s Allegheny Room is the former Farmers & Drovers Hotel. It was purchased by successful saloon owner George Rahn in 1900. He was successful and in 1903 subsequently built the Hotel Rahn on the corner lot next door, which is now the main bar and dining room of the establishment. Rahn brought the beautiful hand-carved wooden bar from the St. Louis Exposition. 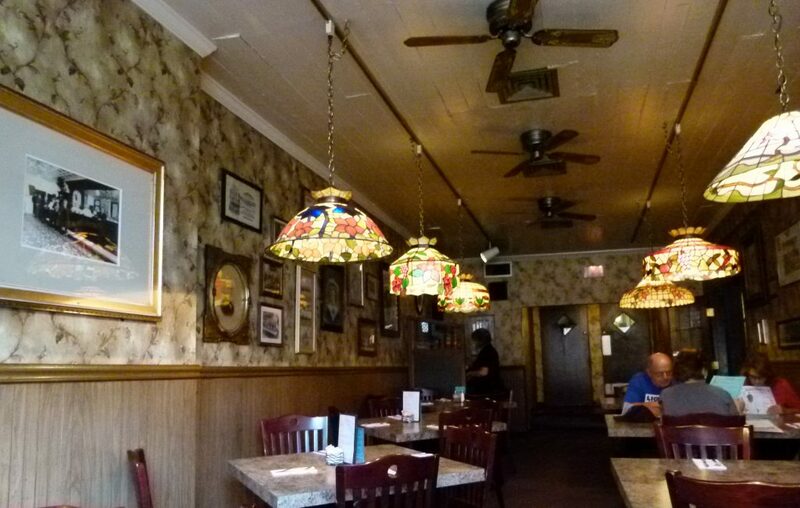 This portion of the tavern also features a patterned, ceramic tile floor, etched glass windows, tin ceilings, upright piano, and old wooden ice boxes. All of Max’s is a visual feast for the eyes with historic photos of Pittsburgh, antiques, and other curiosities. My friend Deborah wanted to get together for lunch. “How about Max’s Allegheny Tavern?” I asked. Having been a North Side girl in her early childhood and always up for a culinary adventure, she readily agreed. Roast loin of pork Stubenkuchen style with German potato salad and sweet and sour red cabbage. Upon arriving at Max’s we were seated in the Allegheny Room and after perusing their extensive menu we placed our orders. Deborah chose the Roast Loin of Pork Stubenkuchen Style (smoked pork loin chops served over a special recipe apple raisin dressing and topped with a rich brown gravy ). She reported that the pork chops were tender and delicious. 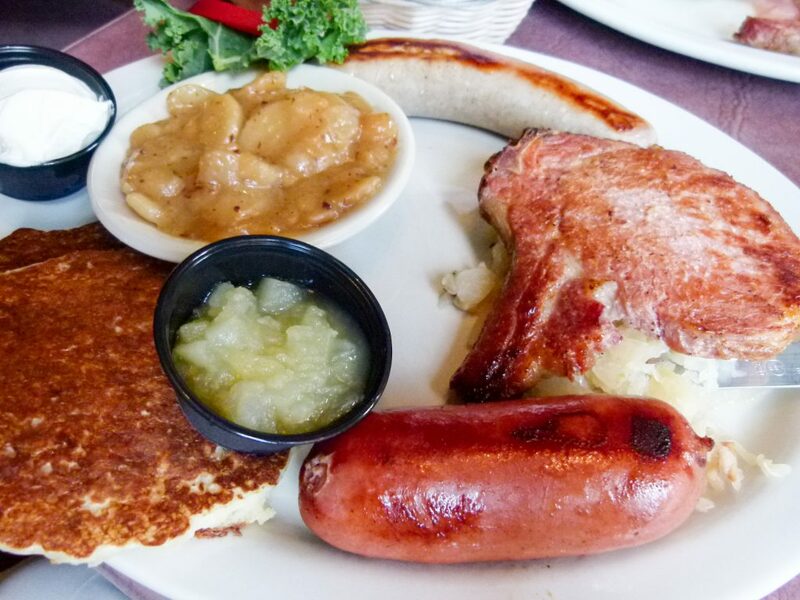 I wanted to sample several different items and ordered the Bavarian Peasant Platter (grilled bratwurst, knackwurst, and a smoked pork loin chop served on a mound of sauerkraut). Both sausages were hot and juicy, the knackwurst was the more flavorful of the two, perhaps due to the traditional recipes of each respective sausage. The knackwurst was all beef, the bratwurst a mixture of pork and veal. The sausages are from Usingers, a traditional German sausage maker operating in Milwaukee, Wisconsin since 1880. 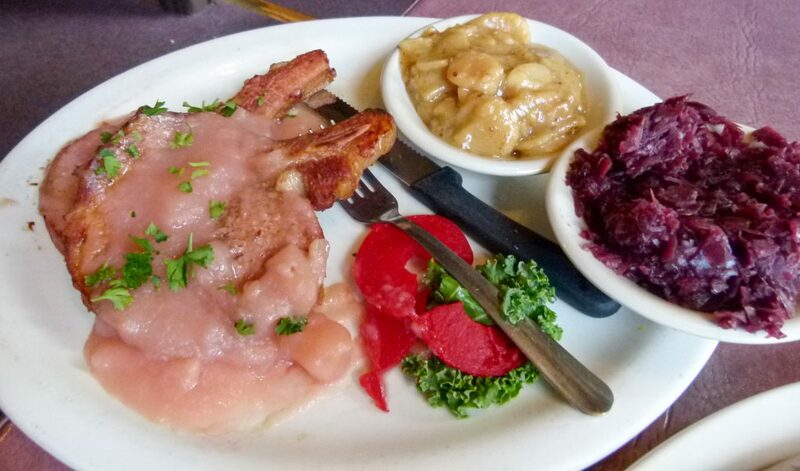 The smoked pork chop was very tasty and the homemade sauerkraut—prepared with apples, caraway seeds and some pork—was some of the best I’ve ever tasted. Both of our entrées were from the Old World Favorites section of the menu and as such came with a nice assortment of rolls with ramekins of apple butter and sauerkraut relish and the choice of two side dishes. I ordered German potato salad and potato pancakes. I rapidly consumed the German potato salad with all its hot and sweet potatoey goodness. There are many different ways to make potato pancakes, Max’s were similar to—in look and texture—Sunday morning pancakes. And like Sunday morning pancakes, were very basic in flavor. The taste of the onions came through but there didn’t seem to be much in the way of other seasonings. However, they tasted just fine with some sour cream and apple sauce on them, much in the way that maple syrup is added to regular pancakes. I ordered the German beer sampler, which features four different types of beer served in draft glasses on a wooden frame with a mat that tells you what each German beer is. They were all delicious brews and included Hacker Pschorr Munich Gold Lager, Kostritzer Black Beer, Warsteiner, and the Bavarian wheat beer Hacker-Pschorr Weisse. The Warsteiner especially stood out for its unique afternotes. I tried to think of how to describe it and finally determined it tasted like subtle herbs and spices were added to the brewing process and imparted a very deep, complex flavor to the beer. Deborah, who along with her husband had an antique business, went off on a little exploratory excursion around the dining rooms of Max’s. After a preliminary report on her findings I joined in. It’s amazing some of the historic Pittsburgh photos, antiques, and other cultural artifacts one can find there. We had burned off a few calories walking around so we gave ourselves permission to have some German chocolate cake and coffee. 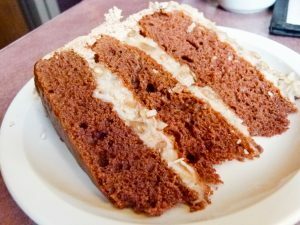 The dessert consisted of three layers of moist chocolate cake separated by decadent veins of German chocolate icing with its shredded coconut and pecans and had a side coating of a lighter whipped chocolate icing. A luscious, sweet ending to a savory meal. 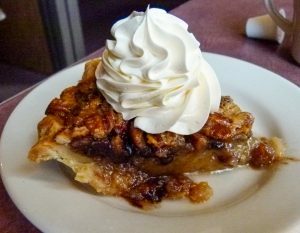 We also enjoyed the blueberry pecan pie. On my next visit I was having another difficult time choosing. 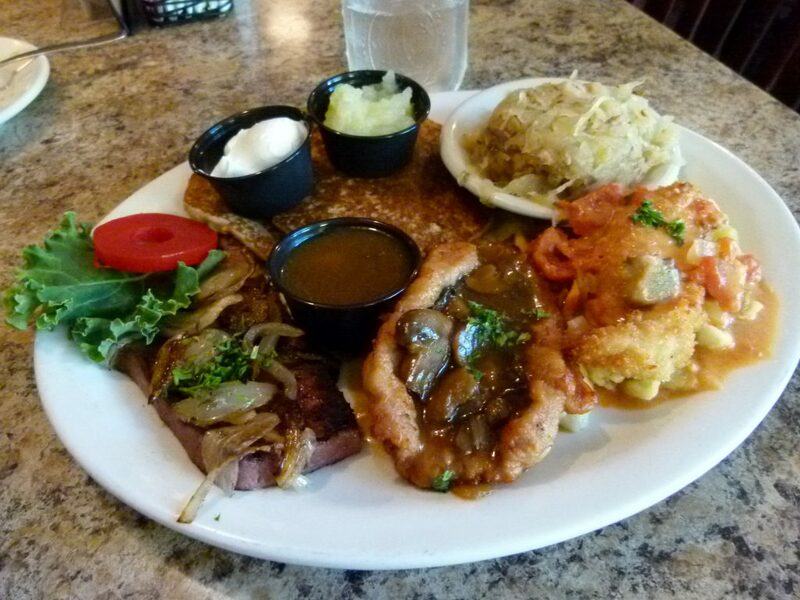 Wanting to try several additional German classics I again chose a platter—Max’s Sampler Platter. With this entrée you choose three items from 15 offerings. For my three I chose jager schnitzel, and chicken Viennese. The jager schnitzel was lightly breaded and crispy fried veal with a mushroom sauce on it. The sauce was just right, not too heavy and not too light, rich in flavor. A sautéed golden brown chicken breast nestled on a bed of spatzle and topped with a sour cream, chopped vegetables and herb sauce was the chicken Viennese. The spatzle was somewhat reminiscent of Italian gnocchi. Rounding out my trio was Leberkase, a finely textured sausage loaf made from a blend of pork and beef seasoned with Bavarian spices and topped with grilled onions. All three items delighted the taste buds. Max’s Sampler Platter with (l. to r.) leberkase, jäger schnitzel, and chicken Viennese. Sides are potato pancakes and sauerkraut. Service was pleasant and efficient, delivered by Carol and Gina on each respective visit. 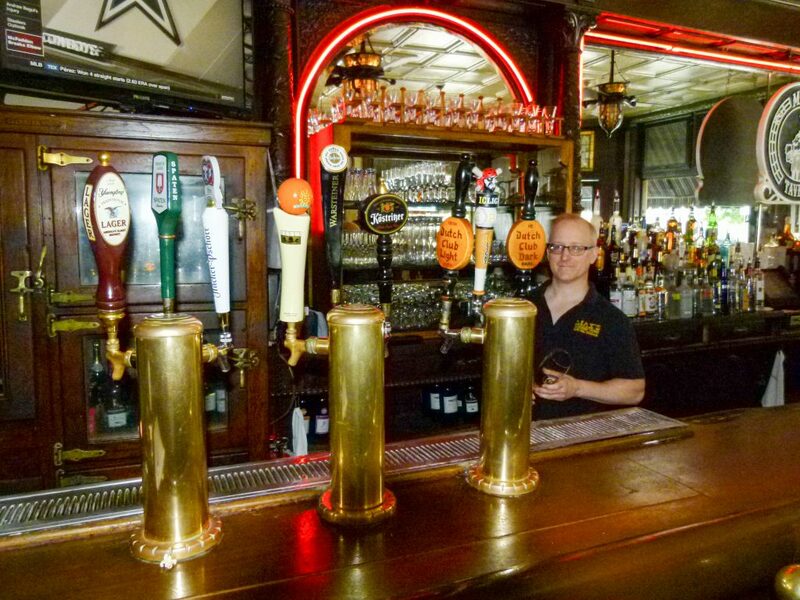 When asked what makes Max’s stand out, owner Doug Diegelman answered “good German cuisine, consistency, and friendliness….a neighborhood restaurant and bar.” His family has owned Max’s for over 21 years. Blueberry pecan pie with whipped cream. If you’re not real keen on German food there’s many other options including burgers, sandwiches, soups, salads, fish, and appetizers. Also offered is a list of monthly specials containing special entrées, sandwiches, sides, and desserts. All desserts are homemade. Every Sunday Max’s has a brunch from 9:30 am to 2 p.m.
During Happy Hour, Monday through Friday 5-7 p.m., the bar offers 1/2 price appetizers and a dollar off drafts. 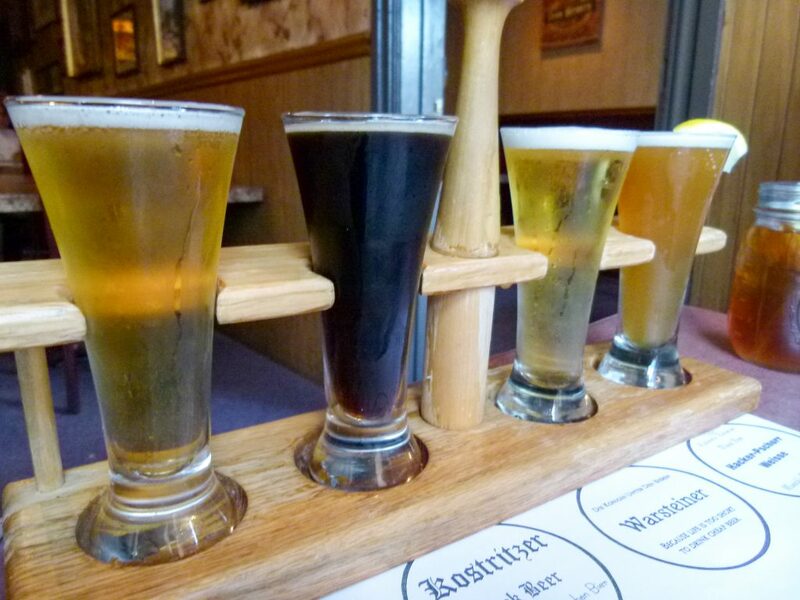 The bar has several German imported beers on tap and even the hard to find Dutch Club. A shuttle service is offered for Steelers Home games. Bartender Patrick Madden is ready to pour a draft beer. Madden has worked at Max’s for over 11 years. Max’s Allegheny Tavern is not only a quintessential German restaurant, but also a quintessential Pittsburgh restaurant. I can’t wait to get back to Max’s Allegheny Tavern again soon. Sunday: 9:30 a.m. – 9:00 p.m.
Rick Handler is the executive producer of Entertainment Central Pittsburgh and enjoys culinary adventures.